Here on A Modern Day Fairy Tale, I really try to keep it a positive place! Rather than focus on anything negative that may be going on in my life, I try to focus instead on what is going well and the many blessings I have to be thankful for. I do the same on my personal social media accounts. And let's be honest, that little bit of positive space is much needed these days, isn't it? 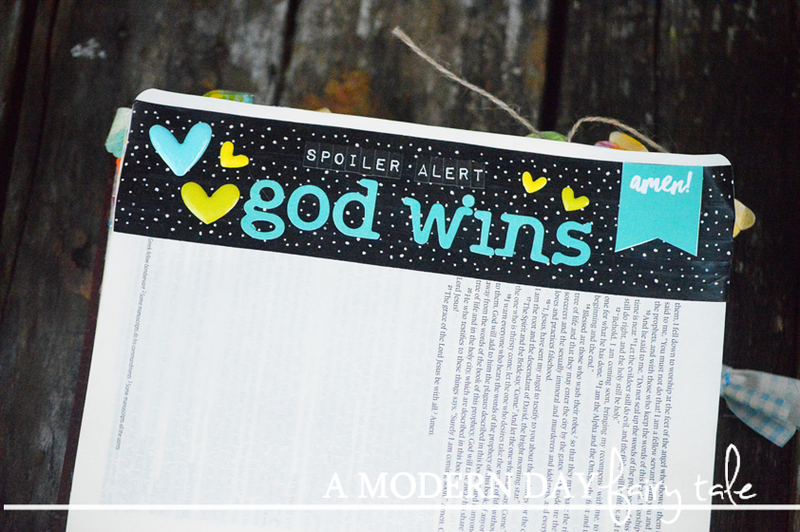 Several weeks ago I saw a fun graphic with this saying... 'Spoiler Alert: God Wins'. I loved that. I've been dealing with a lot of personal anxiety issues in my own life, completely unrelated to those things going on in the world around us. I've truly been struggling to keep it all together and to just hang in there. It's just been one of those times in life where things seems to be piling on one after the other and though you try it's hard to see that light at the end of the tunnel. These words spoke to me. Yes, it's a little humorous, but it's also 100% true. No matter what hard times we are going through, there IS hope. God has already won this war... It may be difficult right now, but one day that day will come. When I heard these words, I knew I had to journal them so I went straight to those last pages of Revelation. The end of the Bible, but not the end of the story. This page was done very simply- the background created with a black dotted Illustrated Faith washi tape (found in the List By Faith devo kit) and a simple focus not on the art being over the top, but on the powerful words on the page. This page was created just days before the shootings in Dallas. Again, this was created in an effort to help me get through my own personal struggles with anxiety but as I thought about these events, I could not help but think that this was an important message for ALL of us to keep in our minds and our hearts right now. Though we may not see it yet, one day we will see that happy ending...and so I share these words and this page with you in hopes that they touch you as they have touched me. He does doesn't he?!? Always and forever!! Love this! This is so important to remember in those tough times that life brings! It is so good to have the assurance that God is going to win and His goodness will prevail! Anxiety and depression are constantly pulling me down. Your words help me realize the God is in charge - let him take the reins! Thank you so much. Very straight to the point, with a mix of humor. I love the quote. And, even amid the chaos, I can be assured knowing that "God wins!" This looks really neat--I've been trying to sit down and do some journaling for a long time now!